We know some of you are talented beyond belief…cough cough Stephanie Coffin cough cough.. So the VHCA is hosting a ‘Call for Local Artists’ for one lucky winner to transform a utility box into a work of art. As part of the VHCA beautification funding, we will be sponsoring a local Artist to paint the utility box located near the sidewalk at North Highland Park. Email your name, zip code, short bio, instagram/portfolio (optional) and conceptual ideas to communications@vahi.org. Winner will be chosen June 1, 2019. Note: if this proves popular, more utility boxes may become available! 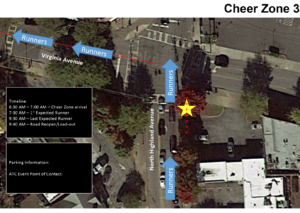 The Atlanta Track Club and Publix are sponsoring a cheer party for runners of the Atlanta Publix Marathon at the intersection of Virginia and Highland Avenue on Sunday, March 17th. The cheer squad will set up around 6:30am and the runners should be passing from about 7:30-9:30 am! See map below. Come out and support your neighbors with cheering and signs! You might be thinking you haven’t heard much from Beautify VaHi in a while… BUT that’s because we’ve been planning MEGA for this year! We are taking last year’s momentum with the Perk’s Plus card, Winter Planting and VaHi Stocking Stuffer Market and were quadrulping it! 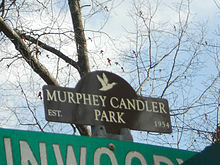 We are so excited to announce a calendar full of neighborhood events and beautification efforts. First, we want to brag on the daffodils we planted by the median sign back in December. They JUST popped up, and somehow it feel like instant gratification. So beautiful. 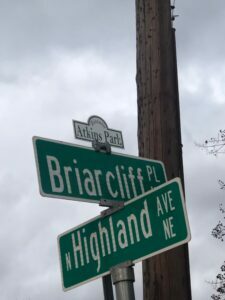 Our Co-Founder, Katie Voelpel, is working with the Civic Association toward a Place-making grant from the City of Atlanta to spice up the Va-Hi median with tables and chairs under the existing trees. Application is due March 29th. Spring Planting Day is April 13th at 10am. We will be meeting at Art Bath Soul for an afternoon of beautification and maintenance in the main VaHi intersection. Join us! To make a donation of money or supplies, please contact katie@beautifyvahi.com. We are scouting a farmer’s market for our VaHi neighborhood residents, hopefully to open this Spring down by Atkin’s Park! Looking forward to a pressure washing of the business corridors this month! New Easter Wine Walk & Dine event is happening in the main intersection the Saturday before Easter (April 20th). Bring your friends for an afternoon of wristband-access to exclusive discounts, a VaHi commemorative wine glass, with wine and appetizers from local restaurants. Only $25, Sign up now on Event Brite! A Mother’s Day Sidewalk SALE-bration is also happening. Similar to the Stocking-Stuffer Market we will be hosting independent artists & owners on the sidewalk of the main intersection. Bring your mom/graduate out to this free event on May 12. A VaHi Restaurant Week in June? We really hope so! Ask your local restaurant if they are participating. The 2nd Generation Perks Plus card is also in the works, set to launch this Summer/Fall. Beautify VaHi is also working with Art Bath Soul to create a co-op/community workspace in the back Enrichment Lounge area. For activities like, book clubs, bead-bracelet making, office hours, small workshops, and more. Contact Ben or Kayla at Art Bath Soul For a free booking/tour during business hours. And that’s about it…for now! We are so excited, and hope that you will join us for all the fun. Contact Katie@BeautifyVaHi.com with comments, questions, & ideas! 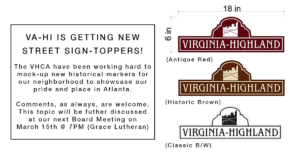 The feedback on what color the sign is going to be…. has been brought to the people! Thank you to everyone who participated in our Instagram and Facebook surverys. We started with about 70 signs and have added a bunch more! No matter what the decision, these are sure to add a fresh pop to our streetscape. Make sure to keep an eye out for these, coming this Summer! Residents and patrons of the library will have the opportunity to provide comments and input on the design plans for the library. 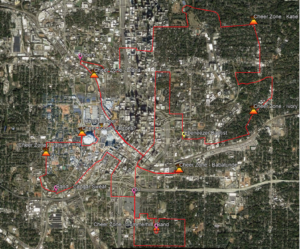 The Renew Atlanta/TSPLOST programs, launched in 2015 and 2016, were created to help address the billion dollar infrastructure backlog facing the city. 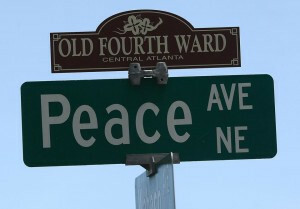 Though the programs have made much progress to date delivering key projects across Atlanta, they face significant budget challenges as we move forward to complete the full initial program scope. Moreover, the cost to deliver the full scope of the initial program considerably exceeds the funding available from the Renew Atlanta Bond and anticipated TSPLOST revenues. We are working diligently to prioritize and re-baseline the initial program lists to deliver the greatest impact to Atlanta’s above-ground infrastructure and transportation network with the available funds. Through this re-baselining effort, we are dedicated to engaging all stakeholders to help inform the process in a transparent and meaningful way. (UPDATE) Public input via survey has been extended to February 7, 2019. Presentation and Survey can be found here. Subscribe to the District 6 Newsletter for monthly updates/news/events in our district! Atlanta Public Schools recently received the amazing news that all 6th and 7th grade students will benefit from the T-Mobile Empower Ed program. What does this mean for Inman? Lenovo laptops will be issued to all 6th and 7th grade students in January. In addition, certain students will qualify for wireless “hotspots” to ensure the availability of WiFi service at home. Thanks to donations from our Inman community that includes our Candler Park neighborhood, the Inman Middle School Foundation had already succeeded in funding over 400 Chromebooks that are already being used in classrooms every day across grades and subject areas. These devices, when added to the new T-Mobile laptops and existing Inman devices, mean that EVERY Inman student will have access to a dedicated device by February! The Grady Cluster is aligned to support the College and Career Readiness platform for our students. These technology initiatives result in students gaining skills to best prepare them for their college and/or job experiences. In the shorter term, increased exposure in the classroom helps increase students’ comfort level for the spring Milestones assessments which are conducted on a laptop or Chromebook. Finally, this technology enables teachers across all grade levels to interact with their students in new and engaging ways while delivering real-time, differentiated instruction based on individual student needs and abilities. The success of this initiative will continue to require support in the areas of teacher professional learning, educational software, and technology updates/accessories. Continued financial contributions from our Inman families and community are therefore critical to maintaining the great momentum we’ve built so far. Please visit www.inmanfoundation.org to learn more on how you can support our Inman Eagles!